What a busy day it was yesterday. We admitted four patients. Early in the day a Northern Oriole,and a Snow Bunting were admitted from Central Wisconsin. The beautiful male Northern Oriole, a male was suppose to have migrated long ago to a warmer climate. He has a wing injury and was not able to leave when the time was right. He will be with us through the winter enjoying lots of waxworms ( Thanks, Jada Baits) and mealworms ( thanks, John Jacobs) as well as frozen berries from the market. He dove into the live worms when he arrived. This morning he had strawberry juice running down his mouth when I checked him. He adjusted to captivity as in a warm aviary in about 2 minutes. The Snow Bunting has a recent wing fracture. His prognosis is good for a full recovery. Snow Buntings are charming "snow flakes" of the bird world. They nest on the Arctic tundra and migrate to Wisconsin for the winter. They are in their element in the cold. They nestle in snow drifts to keep warm. It is amusing to me that this lovely little bird finds Wisconsin and below zero F. temperatures comfortable. Later in the afternoon some kind folks caught up a Canada Goose that was standing near a road. Lakes are frozen in our area. There was no place for the goose to go. He has a wing fracture and lead poisoning so flying was not an option. We began treatment for lead poisoning this morning. 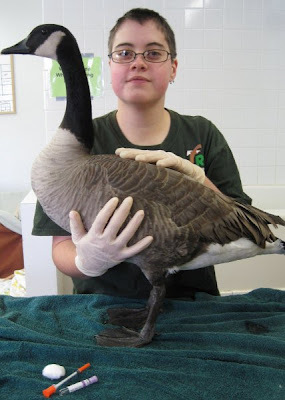 While the Canada Goose is not a rare species, being injured, lead poisoned and cold is never a good thing. 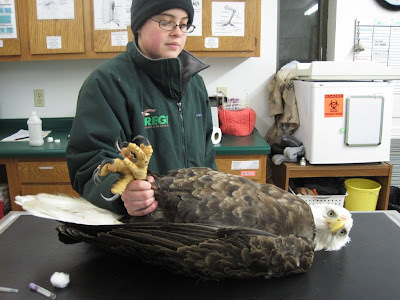 We did blood work as soon as the eagle was admitted. We have our own blood analyser at REGI. We are able to get results of most the blood work within minutes and begin treatment very quickly. Immediate treatment particularly in the case of lead poisoning is very important and has been a lifesaver to many patients. 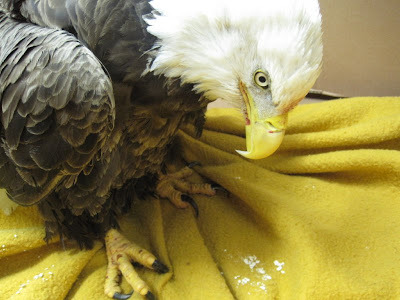 It turns out the Bald Eagle has lead poisoning as well as a broken leg and injuries to both feet from the leg hold trap. 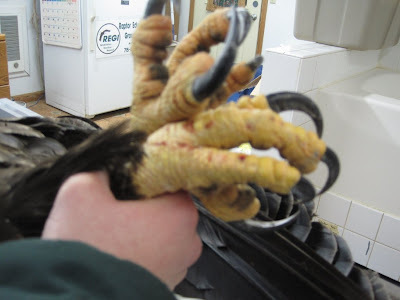 The eagle likely picked up lead poisoning after he was injured in the trap, as he fed on deer "gut piles" left in the woods after hunting season. The leavings from a deer look like good food to a bird particularly since with a broken leg was unable to hunt for himself. He could not have known they are filled with lead from the use of lead ammunition. 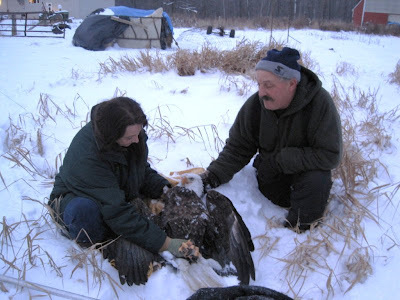 Most hunters are unaware of the danger awaiting bald eagles and other wildlife in "gut piles" left in the woods. We continue to prepare the Common Loon, Duckie for his trip to the Gulf of Mexico. He is eating voraciously ( thanks Hilger Baits) and is getting stronger by the minute.